Our small grants are designed to help you develop your skills and increase the visibility of your artwork. With this money, you can buy the materials you need, showcase your work, and take your art to the next level. Your art can range from painting, music, theatre, writing, photography, pottery, textiles, jewellery making, carving, animation, dance, mixed-media, performance, video and more. Do you live or work in the downtown eastside? 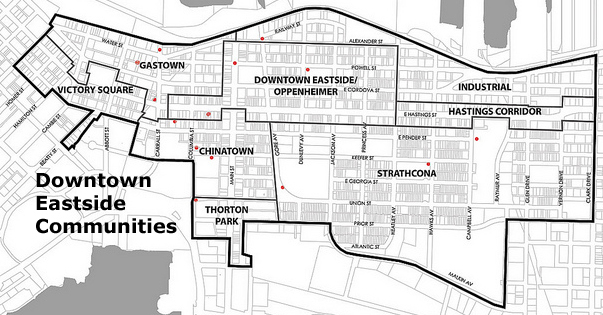 Our grants are only for emerging artists living and/or creating art in the DTES which includes areas of Gastown, Victory Square, Chinatown, Strathcona, the industrial area, and the Oppenheimer and Thornton Parks as shown on the map. The boundaries are the rail yards and port lands to the north, Malkin Street to the south, Richards Street to the west and Clark Drive to the east. Are you interested in an individual grant, or a group project grant? Individual grants range from $500 to $1,000, and are designed to support a single artist to develop their skills. Group project grants range from $1,000 to $4,000, for groups of between two and four people, and are designed to support a group of artists to collaborate in making and showcasing art. Applications are now closed, please check back again in 2019.